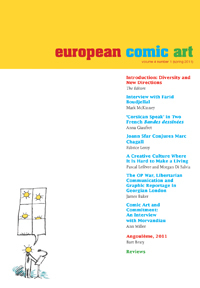 The release of the July 2012 issue of European Comic Art has been a big deal around our offices because it marks the journal’s relaunch as a Berghahn title. Published in partnership with the American Bande Dessinée Society and the International Bande Dessinée Society, it is the first English-language journal devoted to European graphic novels and comic strips. The journal aims to be broad in its geographic focus, covering work from across the continent from well-studied regions like France and Belgium to lesser-researched ones like Eastern Europe. At the same time, it will continue to address a diverse array of topics in the field from extra-European influences to studies of genres and schools to explorations of the industry and its relation to other forms of media to historical context and much more. We’re all very excited about this lively addition to Berghahn’s roster and look forward to the engaging and thoughtful research and writing it will produce.